Tropical Fruit Marshmallow Fluff Salad is a light and fluffy treat. Made with pineapple, cherries, kiwi, and fruity marshmallows, this marshmallow fluff salad is sure to please. And in the blink of an eye, February is out. How is that possible? True, it’s the shortest month of the year, but even so. This was one swift month. I realize I wasn’t around much this month here on Jelly Toast but I had a some really wonderful things going on that were totally un-blog related. I had the chance to put on a wonderful retreat at my church as well as restart the process of the konmari method in our house. I went through the process back in 2015 in our old home and it was – to take a line from the book – life changing. It assisted us in selling our house quickly and move into our new home just months after completing our decluttering marathon. The trouble is, all of the storage and organization we set up on the old house never really transferred to our new home perfectly. Like it happens, things sat in boxes, or got put into the garage with the thought of getting to it later. Well, we’re rounding on three years of living in our new home and we have fallen back into some habits that I truly feel are a result of the move, not that the method of tidying and organizing doesn’t work. So, I’m back at it again, and this time, the organizing and storing will be for a house that we intend on staying in for at least several more years. I’ll be sharing a little more about that process soon! But for today, let’s talk about something light. Something fluffy. Something fruity. 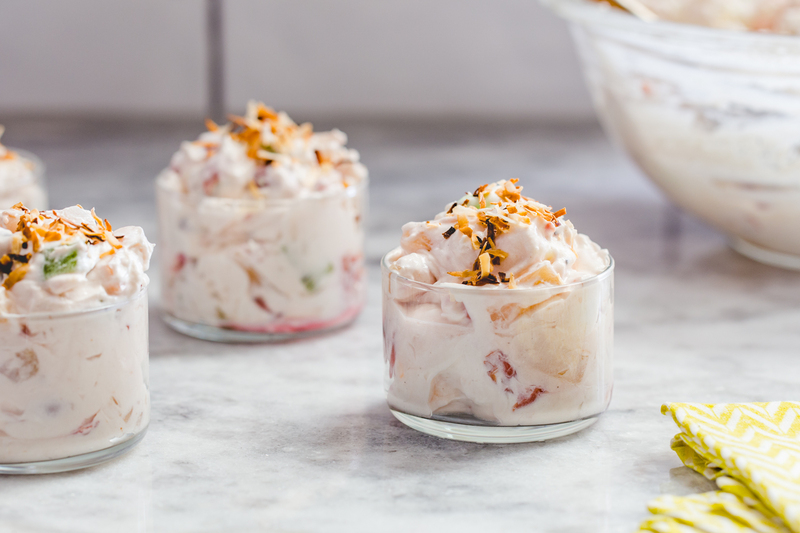 Let’s talk about this Tropical Fruit Marshmallow Fluff Salad. There is something about a fruit and marshmallow salad that screams Spring time. I wonder what that is all about? I also wonder who every came up with this genius idea of mixing fruit with whipped topping, yogurt, pudding, and marshmallows? Then you have the very daring folks who go as far as to call this a salad let alone a side dish. That’s a bold move. Ok, fine. 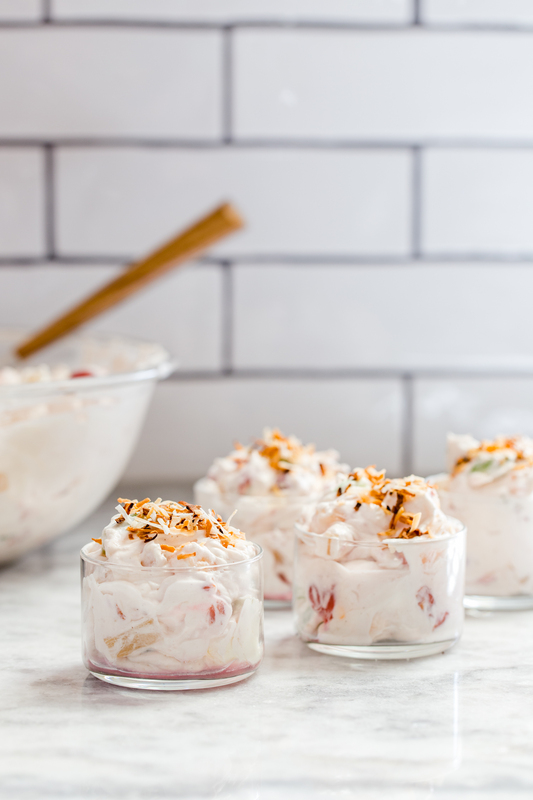 I’ll give you the salad part, but for me, these fluffy, fruity salads fall squarely into the dessert category. There are as many variations to these types of salads as there are minutes in the day. 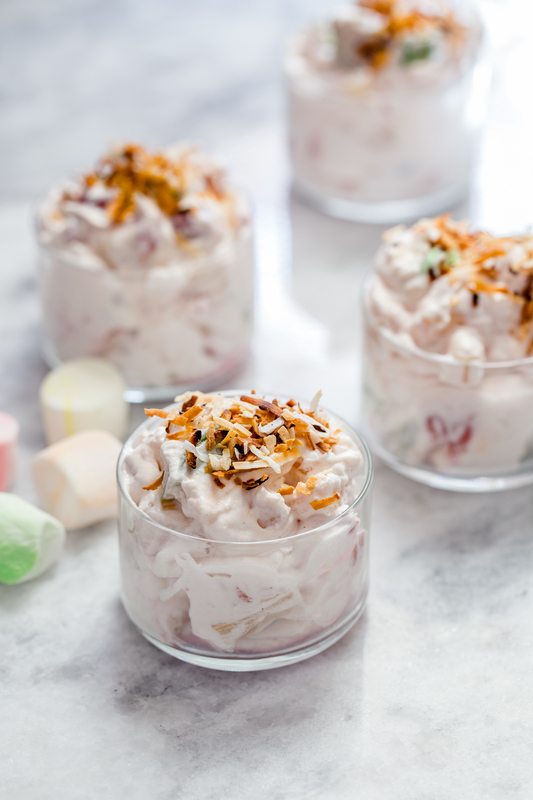 My friend Jamie has an amazing Ambrosia salad that is very similar to this Tropical Fruit Marshmallow Fluff salad. Then we have my grandma’s Queen Salad that has a gelatin component. That is a family staple! I had the urge to make something along these lines but with a tropical twist. 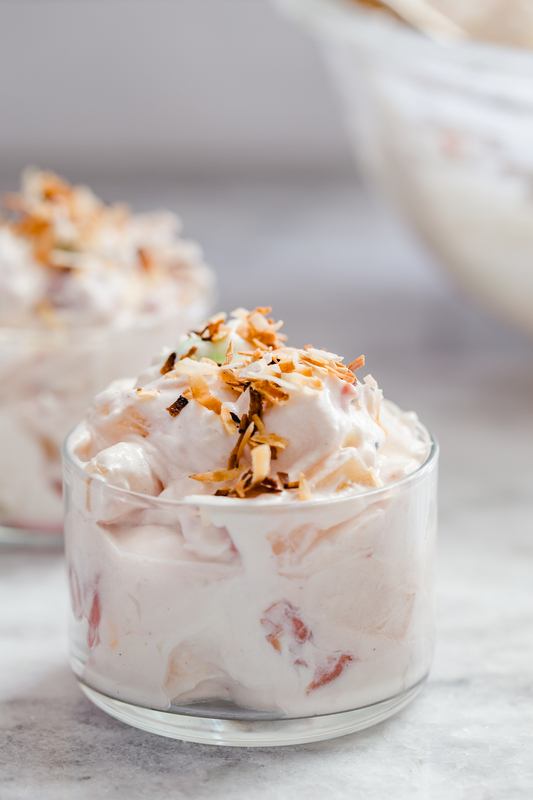 I found an awesome recipe on Together as a Family called Tropical Fruit Fluff that used pudding mix and I really thought that was a brilliant add in. It reminds me of the addition of the gelatin in my grandma’s recipe, but maybe provided more creaminess. In my version, I used canned pineapple, canned tart cherries (in water, not the pie filling) and diced fresh kiwi. 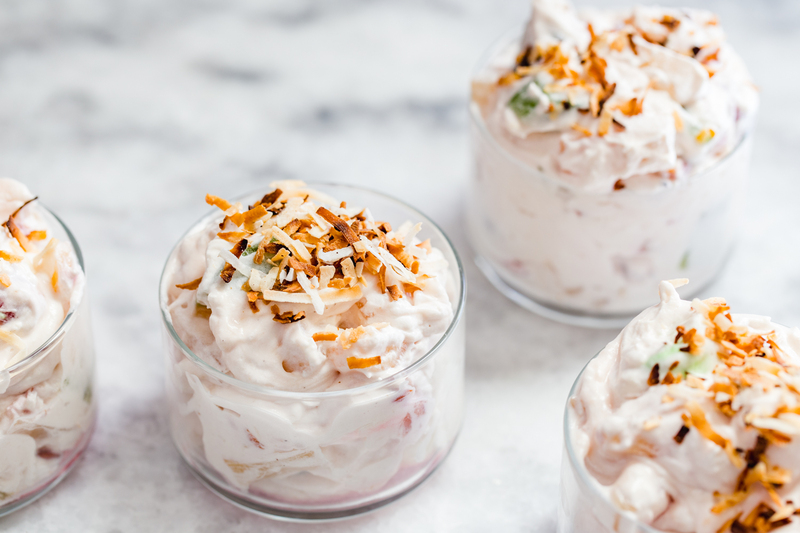 The creamy part is a combination of whipped topping, vanilla pudding, and coconut Greek yogurt. 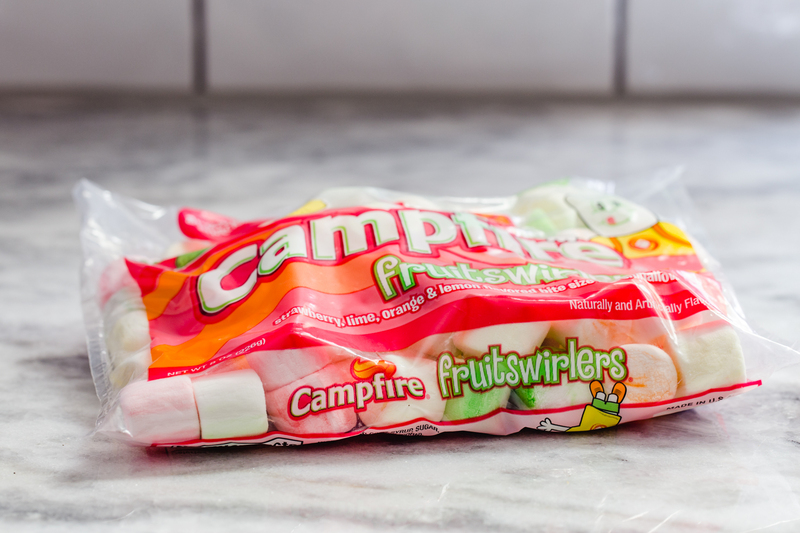 My favorite part, however, might just be the Campfire® Marshmallows Fruitswirlers. They are the softest, fluffiest marshmallows I have ever had. Plus, their tangy fruit flavors – lime, orange, strawberry, and lemon – add a punch of flavor to this sweet salad. Because of the size of these marshmallows, I used my kitchen scissors to cut them in half and they worked perfectly. To finish off the salad, I added some toasted coconut for some additional coconut flavor and great crunch. This tropical fruit marshmallow fluff salad is so sweet and lovely! It’s like a little cloud of happiness. I can’t wait to bring it to our Easter celebration! What marshmallow treats are you planning on this Spring? tropical fruit marshmallow fluff salad is a simple and quick spring time dish that is perfect for Easter or any Spring brunch! In a large bowl, mix together pineapple, tart cherries, and kiwi. Sprinkle pudding mix powder over fruit and stir to combine. Fold in Greek yogurt and whipped topping until almost mixed. Add in marshmallows and stir gently to incorporate. 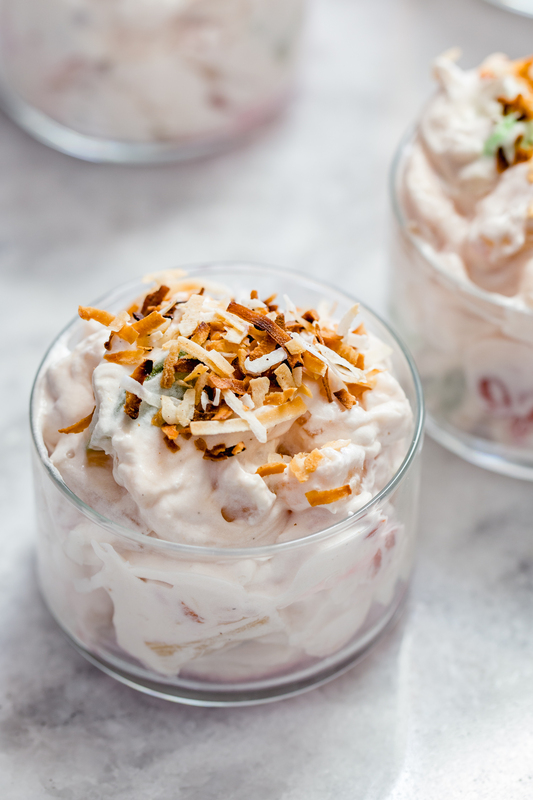 Top the tropical fruit marshmallow fluff salad with toasted coconut before serving. Kitchen scissors work well to cut marshmallows in half. Salad can be made the day ahead.